Legendary actor James Cagney gives a dazzling performance in this rapid-fire comedy satire, directed by Billy Wilder. “One, Two, Three” is a 1961 brilliant American comedy film directed by Billy Wilder, and written by Wilder and I. A. Diamond. The film will be on-screen at the Dunaway Center on Sunday, January 6, 2019 at 2 pm, 23 School Street, Ogunquit, and is presented by Ogunquit Performing Arts. Free admission, parking and popcorn! Pamela Tiffin watching as Horst Buchholz and James Cagney are about to get into a food fight in a scene from the film ‘One, Two, Three’, 1961. The comedy also stars Arlene Francis, Horst Buchholz, Pamela Tiffin and Lilo Pulver. It was filmed in West Berlin and Munich in the summer of 1961. The film is primarily set in West Berlin during the Cold War, but before the construction of the Berlin Wall. It is known for its extraordinary fast pace, taking satiric aim at communism, capitalism, post-war Germany, corporate America, previous Cagney films, alligator shoes, and a host of other targets. Billy Wilder wrote and/or directed a wide variety of pictures during his renowned career. But he’s probably best known for the stunning comedies he created with screenwriter I. A. Diamond. 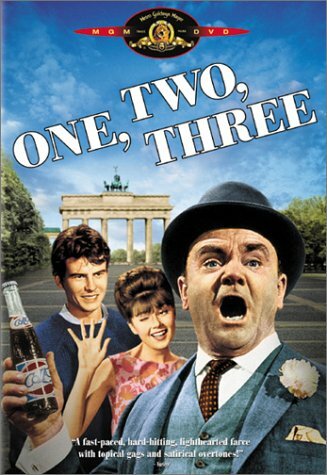 “One, Two, Three” is a prime example, with a mile-a-minute script pitting Coca-Cola against Communism. James Cagney’s performance is a tour de force, delivering pages of script at dizzying speed. Cagney plays C.R. MacNamara, Coca-Cola’s ambitious head of bottling in West Germany, who is determined to cut a deal to distribute Coke to the Russian market while at the same time desperately trying to prevent his boss’s visiting flighty daughter (Tiffin) from marrying a card-carrying communist hippie (Buchholz), while under the disapproving eye of his own neglected wife (Francis). Then in his early sixties, Cagney was not initially certain he should take on the part. On reading the script, he understood that the bulk of the film rested on his abilities and stamina. And indeed, Wilder’s insistence on breakneck, rat-a-tat-tat timing to each and every scene soon began to wear on Cagney, – especially on those occasions when the actor received pages of script only the night before, and then was expected to spit out a steady stream of complex dialogue while handling equally complicated stage direction. Cagney was genuinely irked that Wilder demanded word-for-word perfection and wouldn’t accept even the slightest bit of paraphrasing. James Cagney gives a brilliant performance in the hilarious comedy film, “One, Two, Three” on Sunday, January 6, 2019, at 2 pm, at the Dunaway Center, 23 School Street, Ogunquit. Presented by Ogunquit Performing Arts with free admission, parking and popcorn. Nevertheless, Cagney achieved a triumphant performance and enjoyed a great success with this film. However, “One, Two, Three” also would be his last film appearance until “Ragtime” in 1981, 20 years later. “One, Two, Three” was also banned in Finland from 1962 to 1986 on “political” grounds — it was feared that the film would harm relations between Finland and the Soviet Union. United Pictures Finland tried to get the film released theatrically in 1962, 1966 and 1969 but it was only in 1986 that the Finnish Board of Film Classification allowed the film to be distributed. In a complete reversal of fortune, the film was also received enthusiastically in Germany upon its 1985 re-release in movie theaters. “One, Two, Three” was given a grand re-premier at a large outdoor showing in Berlin which was broadcast simultaneously over television. The film went on to spend a triumphant year in the Berlin theaters as it was rediscovered by West Berlin citizens. Join us for this quick-witted comedy and start off the new year with laughter! “One, Two, Three” will be screened on Sunday, January 6, 2019, at 2 pm at the Dunaway Center, 23 School Street in Ogunquit. The film is shown on a full wall-size screen; admission, parking, and popcorn are free! Ogunquit Performing Arts screens the rousing, romantic musical, Frank Loesser’s “Guys and Dolls” Sunday, February 3, 2019, at 2 pm at the Dunaway Center Admission, Parking and Popcorn are free!